Bainbridge International Inc., based in Canton MA. and with locations in Huntington Beach CA. and Pompano Beach FL., is pleased to now also be able to represent the outstanding line of PONTOS winches in the USA & Canada. PONTOS winches are based on a unique epicyclic gear-train allied to automatic load detection technology. Depending on the choice of model, this approach can offer either 3x more power or 6x more speed compared to all other winches on the market. This technology is of course protected by multiple patents. Racers gain speed in tacks, gybes, hoist and furling. It is no coincidence that 15 competitors in the 2018 Route du Rhum starting on November 4th, will be utilizing PONTOS winches. The phenomenal power of the PONTOS winch allows you to maneuver effortlessly and without the use of electric winch assistance. Current assessments indicate that approx. 25% of the inhabitants of both the European countries and the United States suffer from some level of osteoarthritis. 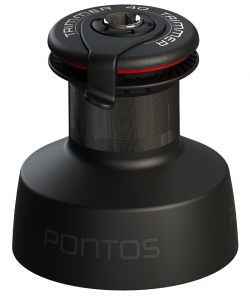 Installation of PONTOS winches would be very effective in making the practice of sailing less physically demanding and much more accessible to them. The use of PONTOS winches for the first time invariably causes a “wow” effect like no other, regardless of skill level or experience!